Officer Guerra and Sgt. Smith ticketing a parking violation on Spring Street. All photos by Joe Linton/Streetsblog L.A. Earlier this week, I accepted an invitation to do a downtown Los Angeles bike-along with City of L.A. Transportation Department (LADOT) parking enforcement officers. 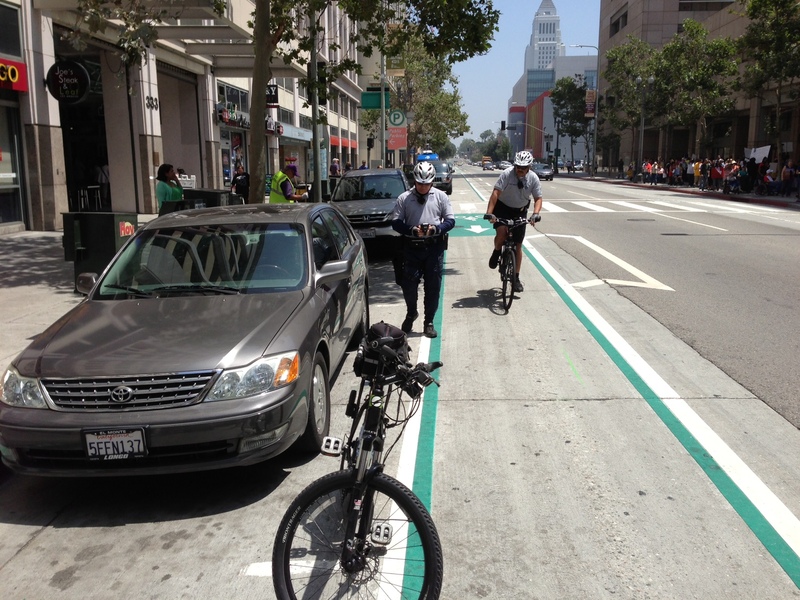 LADOT also uses bicycle officers to do parking enforcement in the Valley, West L.A., and Hollywood. The parking enforcement staff downtown is 30 strong, all on bicycle. Traffic Officer Michael Guerra has been doing parking enforcement in downtown Los Angeles for 17 years. Also accompanying us was his supervisor Sergeant Rodney Smith. 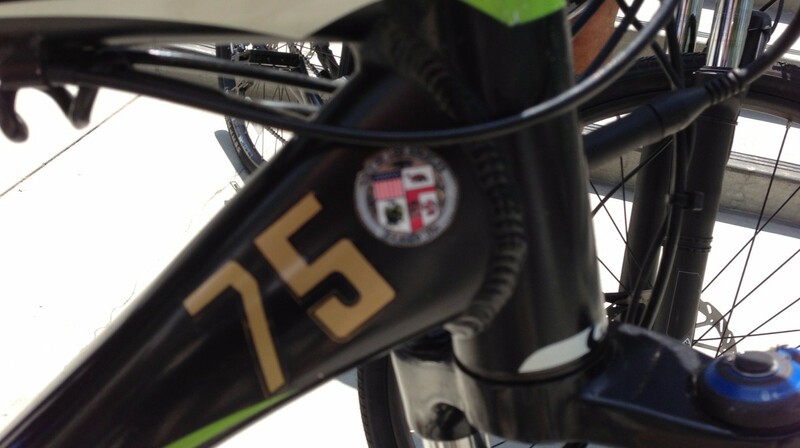 The officers rode on Giant brand bicycles, complete with the city seal and vehicle numbers. This got me thinking that there’s a system in place for managing a city bicycle fleet, perhaps other city staff could use a city bike fleet for short trips. My first question to them was about handicapped placards. Is handicapped placard abuse really as prevalent as I’ve read? Parking expert Don Shoup has asserted that widespread abuse of handicapped placards is a serious barrier to making variable pricing work in downtown L.A. The officers responded that handicap placards were typically on 75 to 80 percent of cars parked in the Little Tokyo and Historic Core, where we were going. And they said it’s worse in the Financial District. This was confirmed during our ride. Many blocks on streets we rode, including on First Street and Third Street, had all but one or two cars displaying a handicap placard. It’s difficult to tell if some or all of these are legitimate. Other LADOT officers have been involved in placard enforcement sting operations typically headed by the DMV. Based on the headlines, both media and law enforcement have little trouble finding widespread abuse. Sgt. Smith mentioned that, in the past, LADOT had tried to push for placard reform via the state legislature, but that it had not yielded any results, and it was no longer a top priority. I also asked about how the city’s L.A. Express Park variable pricing program has affected their work. Though they were aware that prices were sometimes changing, the program had not really made things perceptibly different from an enforcement end. I thought to myself, perhaps the placards do impact managing pricing; with so much placard use, most drivers pay nothing and it doesn’t matter how much the going rates are. It didn’t take long for the officers to find and ticket illegally parked vehicles. Guerra said that it varies a lot, but that he writes 20-30 tickets on a typical day, though typically a lot fewer when it’s raining, and sometimes more around the holidays when drivers frequently park illegally to run in to get last-minute shopping done. On weekends, he writes more tickets, typically 40-50 per day, but that is because there are fewer officers deployed than on weekdays. 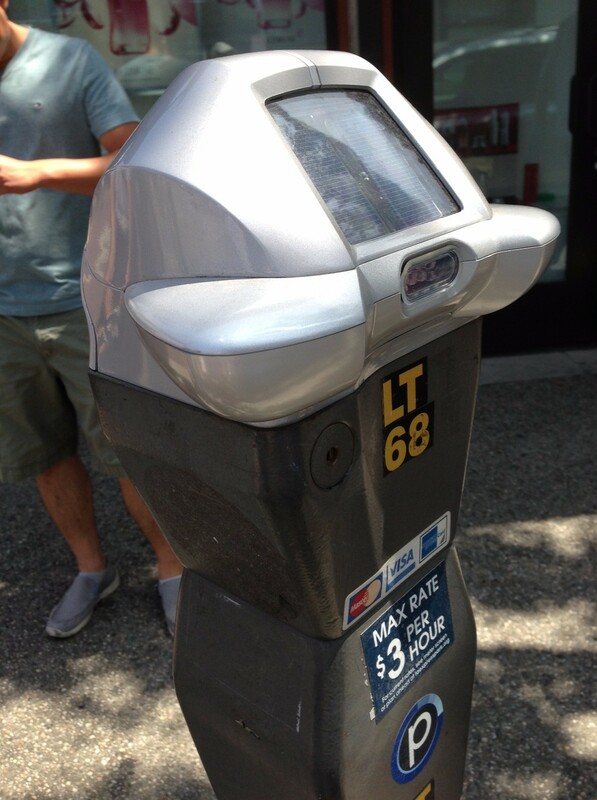 The officers pointed out new technology that the city is testing out in Little Tokyo. In recent years, electronic devices can sense the status of a parking spot – whether it’s occupied or vacant. Some programs, including SF Park, installed sensors in the ground at on-street parking spots. The city of L.A. has had issues with vandalism of past sensors installed, so they’re trying a new device. I asked Officer Guerra his advice for drivers planning to come downtown. Guerra says “if you’re coming for more than an hour, use a parking lot.” He also says that many people unfamiliar with downtown get lost and can’t find their car, so always make a note of the location where you park. For smartphone users, he recommended an app called Parker, made by a company called Streetline. The app shows parking availability, cost, allows users to pay by phone at city meters, and conveniently drops a location pin to help users remember where they are parked. Is there any compelling reason for traffic officers to use those meter maid cars, when they can use a bicycle? I’ve seen these parking officers block bike lanes here in Santa Monica to issue tickets, which is asinine. They may block bike lanes even when there is a red curb nearby where they can stop for a minute. If they were all on bike, this would never happen. The more you narrow the streets and increase density, the more advantageous it is to get around using a smaller footprint, eg by motorcycle, bicycle or foot. Did you ask them about the LAPD’s conversion of that stretch of bike lane to curb parking? Or get them to ride on that street? Are they planning to start ticketing all the police cars that are always parked in the bike lane at the Parker Center Police Building? Or are they still above the law? This could be just fine. In a really-well-functioning city, handicapped people would be basically the ONLY people driving into downtown — everyone else would take public transportation, or park further out and walk. But placard abuse is well-documented — it happens when placards give people *free* parking. Placards are NOT supposed to give you free parking. They are supposed to give you parking which is CLOSE to your destination. Because people with mobility impairments have trouble walking (or rolling) for blocks and blocks. There’s no reason whatsoever to make it free, and making it free attracts the scammers. And of course the scammers make it harder for people with actual mobility impairments to find a place to park which is near their destination — so they may give up and not go there at all! If you make handicapped parking cost the same amount as other parking — but you have reserved “handicapped only” spaces in the prime locations — you DO NOT GET much handicapped placard abuse.